Tengdea is one leading mold maker,injection moulding and die casting manufacturer in China now. We have accumulated about 20 years experience on mold making, injection molding and die castings. Tengdea aims at oversea market especially Europe and USA. Through our extensive network of manufacturing and assembly facilities, Tengdea has a global reach with a breadth of product offerings that is perfect in the mold making, plastic injection and die casting industry. 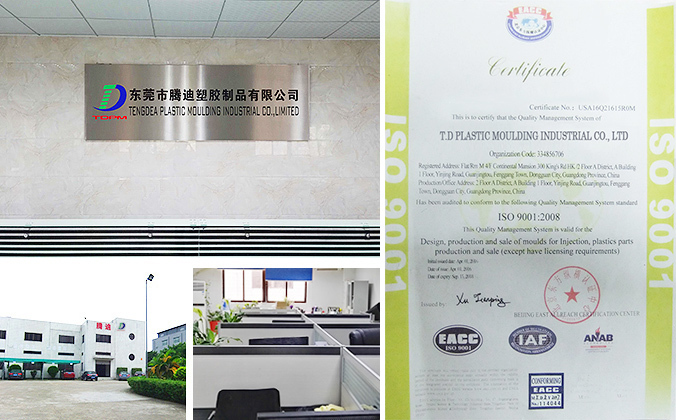 As professional mold maker, injection molding and die casting manufacturer, Tengdea keeps staying in tune with our customers and satisfy every customer's need. It is excellent that both our customers and consumers recognized our outstanding value and ever-lasting quality. We make our experience available to you in a variety of ways. We have completed many projects from different production line such as automotive components, household appliance, electronic products, industrial application, pharmacy and medical equipment, 2K (2 color), Bi-injection, Over molding,die casting dies and so on. We sincerely invite you to test us out and see why we are the best, by ordering some moulds and products. We believe Tengdea is firmly your single source for mold making, injection molding and die casting manufacturers and suppliers.